The northern end of the Roque de Los Muchachos. From left to right, the ATC (half hidden by the bushes), WHT, DOT, LT, SST, Mercator (behind the SST), INT and JKT. Because La Palma has such amazing skies, the professional astronomers have moved in. 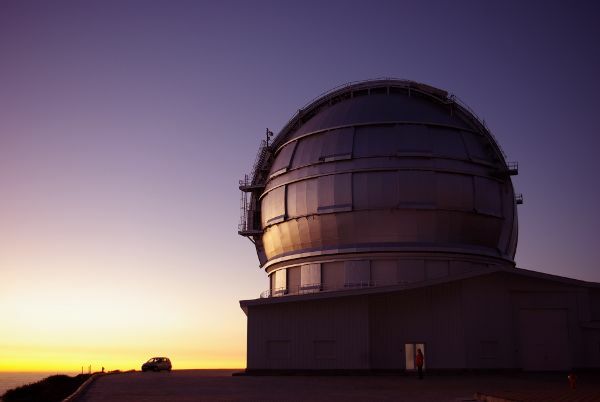 So far there are sixteen telescopes at the observatory of the Roque de Los Muchachos. MAGIC: Major Atmospheric Gamma ray Imaging Cherenkov telescope. Two 17m mirrors which work together like binoculars, to observe gamma rays. Run by a consortium of over twenty institutions from nine countries. Grantecan: Grand Telescopio Canaria the big Canarian Telescope. This is the biggest and newest optical telescope in the world, with a 10.4 m segmented mirror. Run by the Spanish Instituo de Astrofisica de Canarias. WHT: The William Herschel Telescope, with a 4.2 m mirror and many instruments to observe in visible light and infrared. Run by the Isaac Newton Group, a consortium of the UK, Netherlands and Spain. TNG: Telescopio Nazionale Galileo . The Italian national telescope has a 3.5 m mirror. INT: The Isaac Newton Telescope has a 2.5 m mirror, and is also run by the Isaac Newton Group. NOT: Nordic Optical Telescope also has a 2.5 m mirror, and is run by a consortium of Denmark, Finland, Iceland, Norway and Sweden. LT: Liverpool telescope. At 2 m, this is the biggest robotic telescope in the world. Mercator: The Mercator telescope has a 1.2 m diameter, and is run by Leuven University in Belgium and the Observatory of the University of Geneva. SQT: the brand new SuperWASP Qatar Follow-up telescope should start science observations in August. It has a 1 m mirror, and as the name suggests, it will be used to confirm whether stars observed by SuperWASP really do have planets orbiting them. JKT: Jacobus Kapteyn Telescope has a 1m mirror. It opened in 1984, but is no longer in general use. SST: The Swedish Solar Tower observes the sun, as the name suggests. It has a 1 m lens. KVA-60: A 60 cm reflector owned by Sweden. The oldest telescope still working at the observatory. DOT: The Dutch Open Telescope also observes the sun, this time with a 0.45 m lens. ATC: The Automatic Transit Circle (0.18 m) refracting telescope, used for measuring star positions. It was built in Copenhagen in 1956 and started work on La Palma in 1984. SuperWASP has 8 lenses, each 11 cm in diameter to search for extrasolar planets – planets outside our solar system. CILBO: 25mm video camera for tracking meteors. 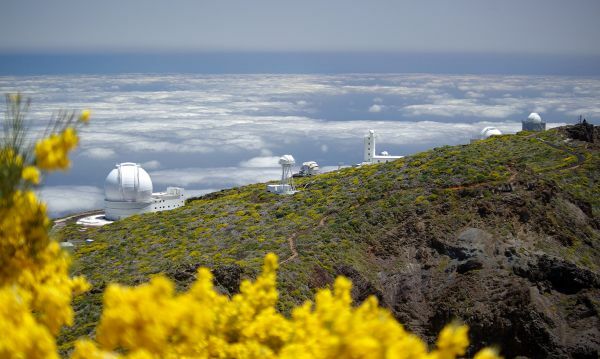 This work fills a void for those who want detailed knowledge of one of the world’s best observatories, the Observatory of the Roque de Los Muchachos. Sheila Crosby knows the astronomical facilities very well and has a special ability to transmit that knowledge and her enthusiasm about the science they do. Now, with this work, she gives the interested visitor all kinds of details about the observatory and astronomy on La Palma. Enjoy your reading.